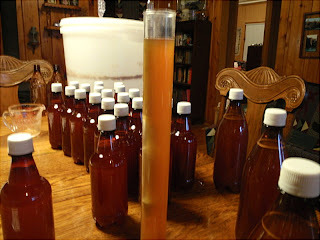 Wherein the reader is invited to learn more than any sane person would ever want to know about a unique home brew. 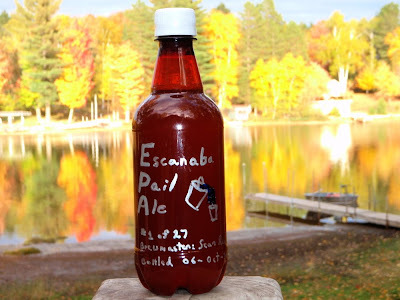 The seed that sprouted and grew into the Escanaba Pail Ale™ project was planted in Yooper soil during the spring of 2005. 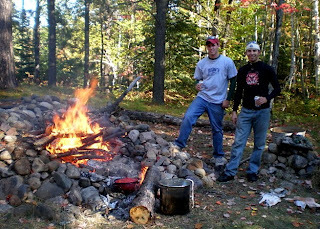 Cousins Joel and Matt visited the UP, and commenced the brewing of Big Shag Big Stout™. 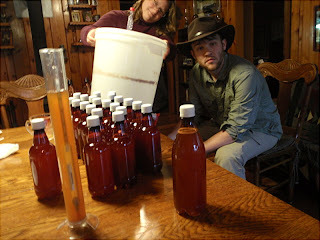 Joel created a brew of extraordinary quality, an elixer that far exceeded the expectations of all who sampled it, filling them with wonder and awe. How could such a thing emerge from the waters of Big Shag Lake? It is a mystery for the ages. 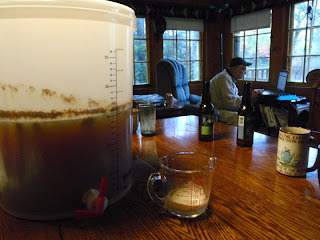 "Perhaps some future trip east from the Brewmaster on Labor Day will mean an all Escanaba brew: water and hops." Alas, the BS2 brewmaster became infirm and lethargic in his old age, would not make the journey East, and the dream of an Escanaba brew was all but forgotten. But the Hop works in mysterious ways and the Way of the Hop cannot be denied. 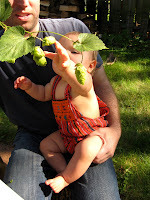 Years later, in a faraway land, at a tasting of the last of the BS2, a new Hop Hope was born. A Brewmaster Apprentice, of the same line of ancient Brewmasters that spawned Brewmaster Joel, tasted the BS2, heard the tale of the wild Escanaba hops and said "I will brew this beer, and it will be a Pale Ale". The expressed apprentice intention became a notion, the notion became a plan and so it came to pass that the apprentice sought the advice of Joel, the Ancient Brewmaster who would not travel. ... and I love it when a plan comes together. 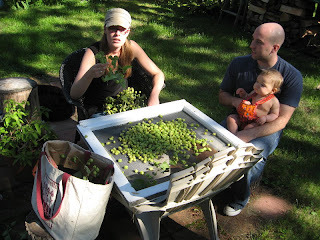 ...and the secret garden of wild Escanaba hops were carefully picked, dried and stored. 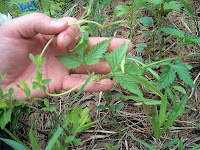 ...to supplement a potential inadequate quantity of wild Escanaba Hops (the HDW migrant hop workers organized and went on strike during the harvest), Mike the K brought in his own work crew to harvest a transplanted German variation which had found a happy home on the grounds of his Menominee estate. 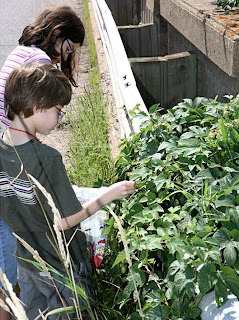 We picked up the additional Mike K hops on the drive to camp. 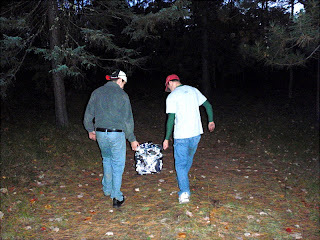 At camp we found the wild Escanaba hops carefully stored, and when the Apprentice Brewmaster and his Assistant fell out of the sky, the crew was assembled and work began immediately. 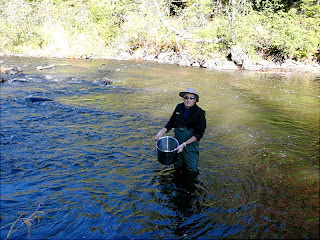 Middle Branch Escanaba River, the only water that will do. 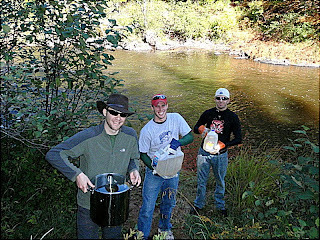 The brew crew hauls the water up the hill. Some had a lighter load than others. 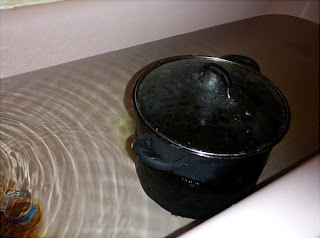 There was a lot of water to boil. This is a good, clean and clear trout stream, but there is no telling what lies below. We would need a long hard boil. We would need a lot of fire. A lot of fire. We would need a lot of firewood. One match. A good omen. But we need more firewood. I assess the situation while sipping on a calibration beer. Whew - that is a lot of water. The fire crew are proud of their efforts. I sent them out for more firewood. 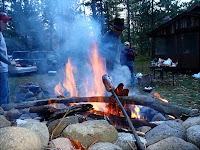 At this point, I was exhausted by the need for the continuous exhortations and exclamations of "More firewood!" 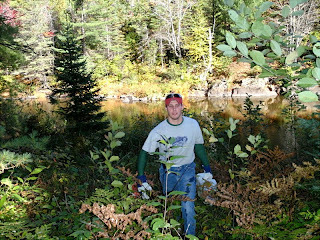 that this slacker crew needed to keep searching, hauling and chopping wood. As soon as I stopped yelling, they stopped working. I felt like Christopher Walken in an SNL skit "More firewood!" "More cowbell!" " More firewood!" I needed a break. 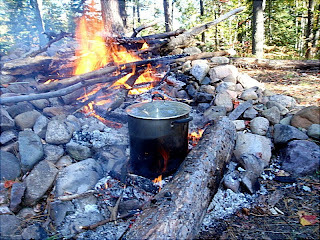 "Just boil this water, and get some more firewood." I said. My tortured psyche craved solitude and a bit of fishing on this, the last day of the trout season. I went down the hill to spend a little quality time on the river. 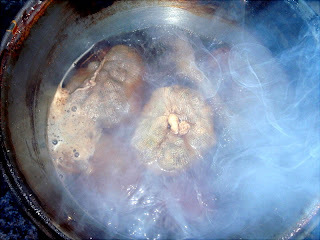 By the time I returned, the water was boiling, the brats were cooked, and the brewing had begun. I was relieved to learn the crew was not completely incompetent as I feared. 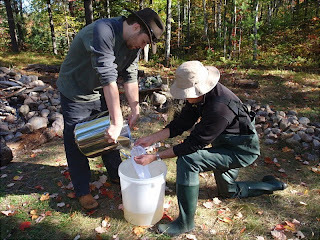 Filtering the water (sort of). 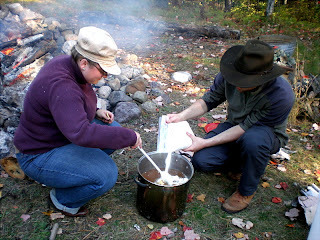 Adding magical white brewmaster powder. Managing this crew takes a lot of energy. 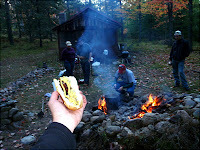 I take time to grill and eat a brat for strength. 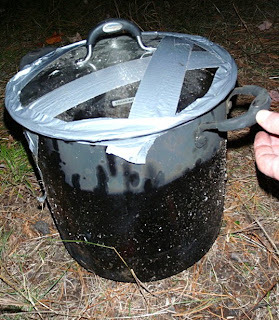 Preparing the wort for transport (use of duck tape is mandatory for any yooper brew). Transporting the wort up the hill. 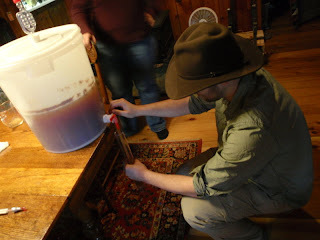 Transferring the wort to the fermenting vat. Wait a week. Magic happens. ...and provides QC on the cap seal among other critical elements. Fermenting vat is tipped dangerously for the last bottle. Mike K was allocated bottle number #19 for his hops contribution. 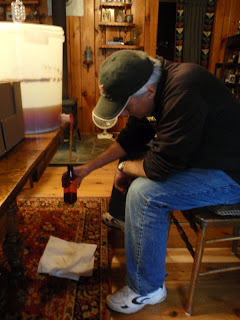 His allocation was cut to the one bottle, as he failed to show up for the actual brewing. Olive was allocated bottle #0, for her invaluable Quality Control efforts, and based on principles of overwhelming adorableness and irresistible cuteness. 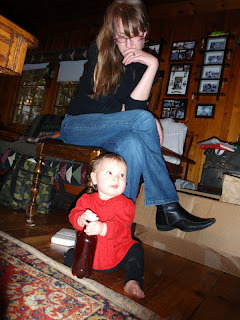 Her bottle will be consigned to Emily for safe keeping. The last bottle poured (#26) was won fair and square by Katie M in a hard fought game of Scrabb. The remainder was split evenly between MW and SR for further allocation to the W and R clans respectively. The rest of the allocation is still being finalized. 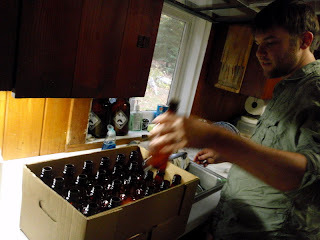 Sean has set up an on-line spreadsheet to track the distribution and consumption of every bottle. Hopefully, we will avoid repeating the as yet unresolved and mysterious tragedy of the unreported and MIA last bottle of Big Shag Big Stout. One bottle each to every member of the Shag Security Council (SJW, RAC, WJO, HDW). I will hold SJW's bottle for safe keeping. HDW is allocated a second bottle for the Wild Escanaba Hops harvest. Brian O is allocated one bottle for his fine fire management on brew day. Andrew is allocated one bottle for brew crew work at lil' camp, and because he will be serving the country by joining the Army in January, and if that does not deserve a beer I don't know what does. 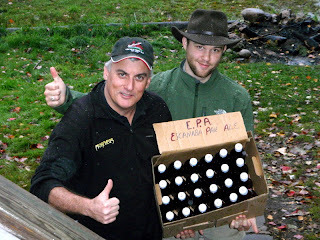 Roy C. is allocated EPA bottle #4 to satisfy an ill-advised wager on your loyal blogger's part. The one large 24 oz bottle (#25) in my allocation is assigned to the Shag Security Council, will be stored at Camp, and may be consumed at any time with the authorization of a simple majority of the SSC. The balance of my allocation will remain in my possession to be consumed as I see fit. I am open to other suggestions, which will be given all the consideration they deserve. Any allocation suggestions or recommendations must be provided as comments on this blog post. Any suggestions received in any other manner (e-mail, text, voice, sign language, twitter, IM's, smoke signals, psychic communications, etc.) will be ignored. A note regarding labeling - Noted marketing genii Sean R and Brian O have both indicated their good intentions to develop labels for the brew. The road to hell being what it is, I have taken a silver Sharpie to the bottle pictured above (#1 of 26). All other bottles are simply identified by their number on the bottle, and an "R" for the four Rea bottles left at camp. For those who wish additional identification marks on the bottles left at camp, please indicate your preference in comments (same rules apply as indicated in prior paragraph) and I will attempt to accomodate. Purveyor of bottled beer, wine, soda, sake and cider from around the world and just down the block! However, since you chose a design without the input of your co-brewmasters, I expect that you will apply a similar label to the bottles that remain at Shag. Furthermore, you will make your services available for the eight bottles I have upon your return to San Francisco. I hate to be a stickler, but due to the many complaints surrounding fairness of the BSBS distribution I would like to assure that each taster has a parallel experience. Anyway, With all due respect, as I indicated in the post (toward the end, so you understandably may not have gotten that far), I explain that this label was a one shot deal, only on one bottle, needed for a picture on this post, and a stop gap measure while waiting to see the label you or BO come up with. That said, if you really want this on your bottles here, I will endeavor to do so on your four bottles at camp - time permitting. With all due respect, an allocation of TWO BOTTLES coming to me is entirely outrageous. The wild hops demands at least a sixer. 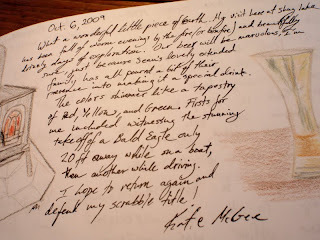 Excellent blog--like being there. But with all due respect I think it would be strengthened by some tech notes from the Apprentice Brewmaster (Hop menu, boiling times, O. G., color, clarity, etc.). Without those details the Apprentice will never be able to move up to Journeyman Brewer, let alone Master Brewer. 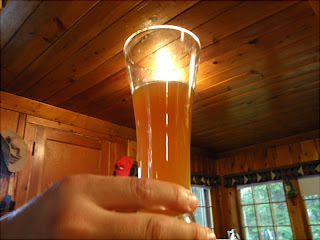 Also, one final note, no offense*** to the namers of this brew but but Escanaba Pale Ale is sort dry. How about Something like "Mine Tail Pale"? BTW - don't you love the phrase "no offense" It means the same as "I'm about to insult you, please don't pop me in the nose"
I had to retract my original comment as I replied to Matt too hastily -- my apologies to the author of this blog and anyone who may have read my draft comments. With respect to the brewing details; those will be coming shortly. With respect to the name, I feel that a second reading of the post may be necessary for Matt to achieve full comprehension. 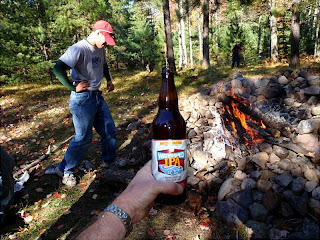 "Pail" in the brew name is not a typo; it refers to the first step in the brewing process wherein pails of water were carried from the banks of the Escanaba and back to Lil' Camp. You should strive to emulate Robyn and accept your lot in life. 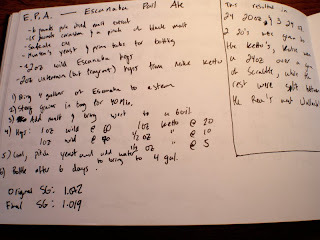 Given that Mike K contributed four times the quantity of hops as did your meager Wild Hops harvest crew, the case could be made that half of your allocation should be given to him. Clearly Matt has some reading comprehension issues. You need to be less critical of his "special" needs. 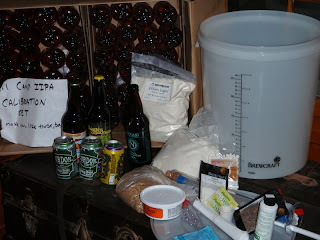 Secret brewing formula has been updated to the blog from brewmaster notes found at camp. We endeavor to accomodate our loyal reader. What is the alcohol content ? can you tell from the SG ? I would prefer the hand drawn label, and please store my allotment as well as Roys allotment in the secret place. If you dont hear from roy please store his at the same location. I believe the bottles should have a label with a pic of me on it knocking over some food. 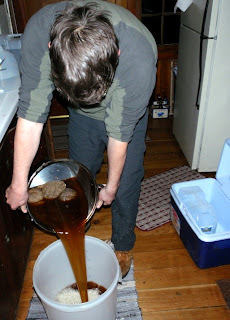 I think its only practical considering that was part of the history of the beer making. Ok, you can have your BFF design that label for you. the question is - what do you want me to do with your bottle? Bring it back or leave it here? And do you trust that if I give it to your BFF, he will get it to you? I am sure Andrew would be ok with you giving me his bottle to hold on to for him. Please bring both of our EPA bottles home with you from the trip. I also agree that you were the first one to come up with a label so it is your job to put it on every bottle. Second, the extra bottle that is for everyone in the shag security council should not go with you to San Fran. I was thinking I could hold on to it as a neutral party and be able to distribute it among the council members in the area. It is the fairest way for them to get their sips. I would even be willing to document it and the expense off a few sips of my own. Most importantly drive safe, we do not want anything bad happening to the bottles during transit. WTF? You said you were going to put your college education to work and design a label for the EPA. What happened to that plan? Good thing I didn't have you manage anything more than Andrew in this project. 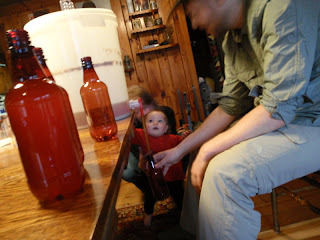 Yeah - I'll put a label on your bottle for you... time permitting. I am sure you are right that Andrew will be ok with my giving his bottle to you. However, with a commodity of this value, what you think, or what I think, just isn't good enough. I simply cannot turn his bottle over to you without express written permission from Andrew. Finally, I think that is really a great idea for Shag Security Council bottle #25. All you have to do to get that to happen is get the unanimous approval of all five members of the council, and I will immediately hand over the bottle to you for safekeeping. BTW - due to some new concerns I have over your reliability (ref: EPA Label) I am voting - no. I would love if my 2 bottles were brought back from Michigan that way I can ensure Brian makes his payment. Have a safe trip back.